Hey! I read (or listened to on audiobook) a lot of books this year. Here are my top five! A quick read that reflects many of my thoughts about living with a visible physical disability! I believe this is the first book I’ve ever read about disability. It’s just never been something that’s never interested me, reading-wise. I have my own beliefs about disability, which, when asked, I’ve shared with individuals and groups of people. 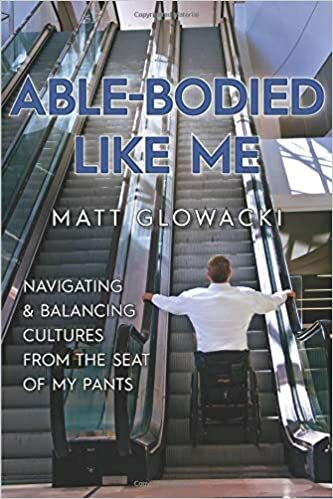 But when I heard that civility speaker Matt Glowacki, who I used to play wheelchair basketball and softball with back when I lived in Missouri, was writing a book, I got excited. Matt was born without legs and has used a wheelchair to get around for most of his life. I knew Matt was someone who would share some similar views on disability and what it’s like to be a person who uses a wheelchair. While my experiences don’t align exactly with Matt’s (not all wheelchair people are the same, haha), there are so many things I identified with. Although this book is fifth on my list, I’m going to recommend it more strongly than any other book on here. If you want to know what it’s like to have a disability like mine, go read this book. Also, it’s short and really interesting! Buy it here, or ask to borrow my copy! The book that (might have) changed my mind about mysteries. I have only ever read TWO mystery novels in my life, and both have been part of a book club I’m in through our local independent bookstore, Novel. It’s simply a genre that’s never interested me. I love fantasy, where heroes and legends are born and the fates of whole worlds are on the line….compared to that, discovering who murdered some random person has always seemed to me kind of boring. A fascinating true-crime book that shows the extent to which corrupt people in power will oppress others. Another book club book that I would have never picked up on my own. This impressively-researched true crime story is insane. You know when you watch a movie and the villain is really evil, and you think, “Nobody can really be that evil, right?” Well, the bad guy(s) here are that bad. It tells the story of the systematic murder of wealthy Osage Native Americans in the 1920s and how the FBI rose to prominence by “solving” this case. I won’t spoil anything else here, but I’ll just say that the lengths that we white people have gone to exploit Native Americans is mind-blowing. Powerful memoir, and a story worth telling. This memoir tells the story of Walls as a little girl growing up in a dysfunctional family. Her relationship with her father was interesting to me. He loved her, in a way, but he was also neglectful and manipulative. This is Walls’s journey to desire her independence, then fight for her independence, then reconcile with her family who has failed her and her siblings in so many ways. It’s also beautifully written. Before I reveal my number one…Honorable Mentions! …and my least favorite book of the year! Okay, so I think it’s generally a terrible idea to hate on things that other people love. People who do that are the worst. But I just could not enjoy this book. Once I got about a quarter of the way through it, I looked up reviews and saw that people LOVED this book, and it seriously blew my mind. I found it incredibly boring and (for a novel marketed as a comedy) not funny. It turns out it was parodying over-dramatic doom and gloom novels about rural English life in the late 20’s/early 30’s, which I didn’t even know was a thing, so I think that’s why most of the humor was lost on me. And finally! My number one book of the year! Aliens, science fiction, philosophy, Jesus, and the immense literal and metaphorical distances between us. Remember when I said I don’t like mysteries? You heard me wrong. I don’t like murder mysteries all that much. This story had me asking, “What is really going on here?” the whole time. It’s about a man who is hired by the government to be the first Christian missionary to another planet, where humanity has made contact with an alien species. And the alien species craves Christianity and its stories and, in particular, the healing power of Jesus. To be clear, this is NOT a “Christian” book. If you like labels, it’s a literary science fiction novel. Although the author is not a Christian, he does a good job of showing beliefs of Christians without caricaturing them. He also avoids making the book preachy or religious or overly-allegorical, like many Christians authors might do. In sum, I’d highly recommend this book for both Christians and non-Christians. While the protagonist is off successfully sharing the Gospel, he has a hard time connecting with his wife, who is alone on Earth, struggling to keep her faith while natural disasters start tearing the world apart. He’s having huge successes, while his wife falls into despair, and it’s difficult for them to share and relate to each other’s vastly different experiences. It’s like the challenges of dating long distance times a thousand. In real life, the author’s wife died from cancer prior to writing this book, and this story line serves as a powerful metaphor for the inability to fully empathize with a loved one who is going through a life-ending struggle. If you like science fiction and/or literary fiction and/or thinking about how another sentient species might view a foreign religion that promises them hope, then pick up this book. Or borrow it from me! Here’s to another year of reading! Let me know what your best book of the year was and why I should read it in 2019! And if you’re curious, here’s my full list of books I read this year. Posted in Reading!Tagged books, Reading!